Michael Schroth focuses his legal practice in the areas of employment law, estate planning and probate law, business law, and real estate law. Mr. Schroth has represented individuals, families, small businesses, large companies, municipalities, and boards of education in hundreds of cases throughout Ohio. 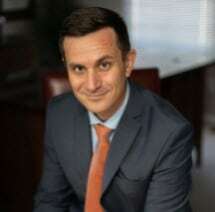 A proponent of cost-effective and cooperative solutions to complex problems, Mr. Schroth also has a wealth of experience advocating for his clients’ cases in various settings. He has successfully argued cases before trial courts and appellate courts throughout Ohio, as well as local Boards of Revision, the Ohio Board of Tax Appeals, the Industrial Commission of Ohio, and the Ohio Unemployment Compensation Commission. Mr. Schroth is licensed to practice law in the State of Ohio. He is a member of the Ohio Bar Association, the Cleveland Metropolitan Bar Association, and the Lorain County Bar Association. He also serves as a volunteer attorney for Hospice of the Western Reserve. Mr. Schroth obtained a B.A. from Brigham Young University and his J.D. from the Cleveland-Marshall College of Law. A graduate of Westlake High School, he resides with his wife and son in Avon, Ohio.